TSO Custer Creek professionals specialize in the understanding of the human eye. Many diseases that affect your vision do not have obvious symptoms. 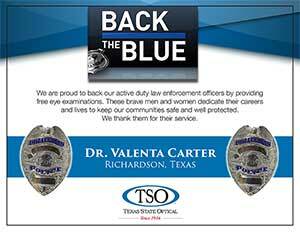 Your Richardson eye doctor, Valenta Carter, knows how age and risk factors affect your vision over time. 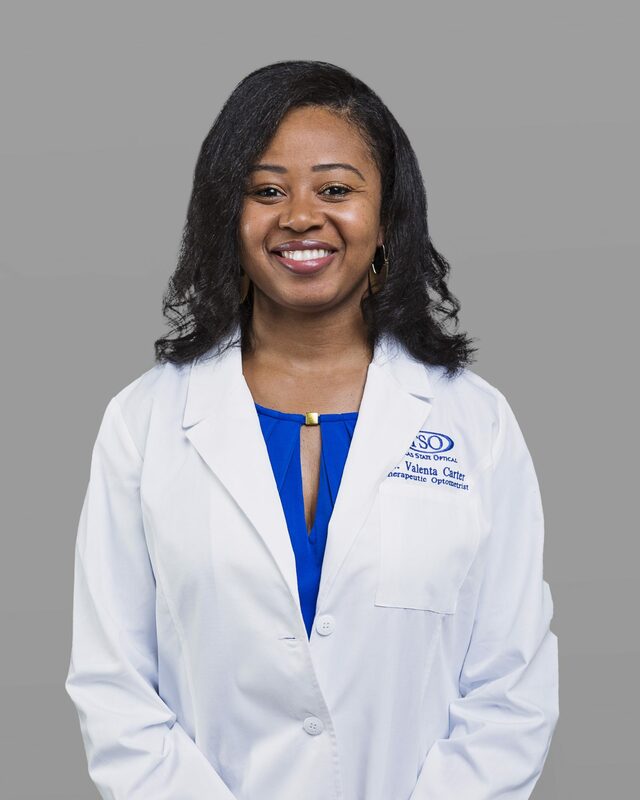 Dr. Carter takes the time to explain the results of your eye exam, listen to your eyecare needs, and describe the best options to enhance your vision. Maintaining good eye health is an ongoining partnership. We encourage you to ask questions and share your health information, which could be vital to monitoring, diagnosing, and treating potential vision problems. Our exceptional eye care staff is our greatest asset. They are excited about providing the best vision care for each and every patient. Jessica’s passion for the optometric field is displayed through her 15 years of experience. She is certified by the American Board of Opticianry and holds an Associate degree in Science. Her longstanding commitment to continuously increase her knowledge with the newest optical and eyewear innovations allows her to provide quality optical care to every patient. Jessica spends her free time with her husband and son enjoying family events in the greater Dallas area.